There is a fantastic worship song with the line “break my heart for what breaks your’s.” Oh, man, if only our hearts were broken for the things that break God’s heart. I love when I get the honor of knowing women who have a heart for the things on God’s heart. Kerri Wellendorf‘s heart is broken for what breaks the heart of God. She has a heart for the orphan. Let her story wash over you as you see God’s picture of redemption in the life of Kerri. There’s an anonymous poem called A reason, a Season, a Lifetime. It explains that once you figure out which your encounter is, you’ll know what to do with it. So, how did this start? When did He plant the seed? Was it riding the bus in elementary school with ‘that family’ that always had different kids in hand me down clothes getting on and off the bus? Was it when my grade school BFF took a 2-year-old into her care on a regular basis outside of DHR’s involvement, after experiencing a lifetime of heartaches & heartbreaks of her own? Was it when, as a family, we started supporting Kids to Love at Christmas time, and started sponsoring a sibling group, since we were well aware we had more than enough, and wanted to come together for a great cause? Was it being under leadership of a broken turned beautiful, transparent Life Group teacher, who every step of her ever-changing journey bared her heart and soul to the class? Was it reading Kisses from Katie? Was it losing my dog early in her life, in 2011, and starting the process of fostering to adopt other dogs to see if they were the ‘right fit’ for my family of four-legged children that I already had? My guess is, He had this ALL worked out, that my heart and life hunger could digest what was in front of me, in His perfect timing. Along the way, He has pricked my heart for an international sponsorship program, put adoptive families in my path, and even recently, has placed foster to adoptive families right in front of me, and even called other single friends of mine possibly on the road to fostering to adopt. I’m single. Never been married. I’m a foster parent. Since I can remember, I’ve longed to be a Mother. Coming from a large extended family as well as part of a blended family, I knew what it was like to always have and be around family. I’ve been the ‘maternal’ one, a ‘old soul’, and I was that girl who took the Red Cross babysitting courses. Problem was, we didn’t live in a neighborhood; we lived down a dirt road, with a route and box number for a ‘street’ address. Ever since God wooed me back to Him, He knew He was about to start laying out a much different and eternally more beautiful plan for my life than I ever imagined. Since those times in late 2007, God has turned my world upside down. I want/wanted children, but usually there is a very necessary component for that (or at least I thought)–A husband. Initially, of course in my selfish ways, I knew I could easily have a child without a husband, but, as this walk continued, He changed my heart, & revealed to me that there were plenty of His out there, that needed my love, even without giving birth to them. 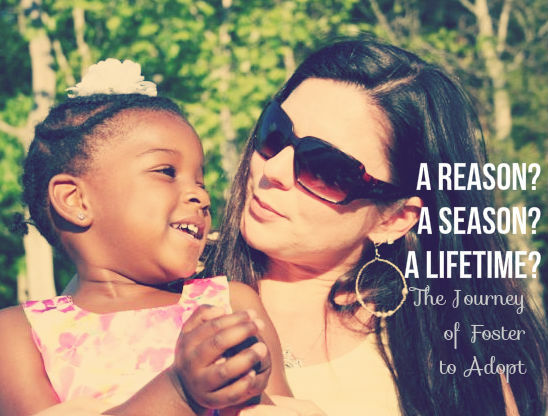 In 2007, a husband was nowhere in sight (and still isn’t for that matter) but, in 2008, I started having a tug at my heart for fostering to adopt. I still long for the ‘traditional’ family-husband, 2.5 kids, & white picket fence. But, as He would have it, like He promised, He is not only giving me the desires of my heart, but He is changing those desires to actually become HIS desires to fulfill His purpose for me and my life, FOR HIM, not for ME. It wasn’t until 2011, I really felt like I needed to ‘do something’ with all of these breadcrumbs He had dropped for me to find my way back home to His purpose for me. In the Fall of 2011, I began GPS classes with DHR to start the process of becoming a foster parent. God assured me of His plan when, on the first night of classes, as it got dark and as I was trying to rush inside to get out of the rain, one of our church bulletins was face down, with Pastor Mark’s face staring up at me. “Ok God, I guess you got this….”, I thought. In early 2012, I was officially a licensed foster parent!!!! My Social Worker was aware that my primary goal was to foster to adopt (since I can’t afford international adoption), but, when you get ‘that call’, you can only imagine what it’s like to waver back and forth in that decision, knowing there’s a child in need, even when you know it isn’t forever. Then….I waited and waited and waited. Over the course of the last 2 ½ years, I’ve had 3 placements, and now have an almost 3-year-old with me, whom I’ve fallen in love with! All that I know is that I’m to be obedient, and I’m NEVER alone on this journey. Each time I’ve gotten a call, I’ve briefly panicked, prayed, made a few phone calls, asked for advice (since daycare, after school care, and an IMMEDIATE support system has to be ready to be in place at the drop of a hat), and in the end, God has given me His answer for each situation. For now, I’m still living amidst the reasons, and seasons; but I’m praying for the lifetime. Along the way, He’s helped me to see that He’s ‘got this’….He doesn’t need me to fulfill these plans and purposes, but, over time, I’ve realized that He hand-picked ME, little ol’ ME, to sit on HIS front row and see what He has in store for my life. I could tell you God story upon God story with each of my foster care placements in the last 2 ½ yrs. I’m anxiously awaiting more in this journey, in my current season, which may last a lifetime. Question: How is God calling you be a difference maker?